The Swiss Paraplegic Centre (SPC, www.paraplegie.ch) in Nottwil, Switzerland, is a privately owned, leading acute care and specialist hospital employing more than 1,500 health professionals in 80 different occupations that focuses on world-class primary care and comprehensive rehabilitation of patients with spinal cord injuries. In addition to the SPC’s extensive range of medical and therapeutic care, treatment and services, the hospital offers advisory services, as well as research in the areas of paraplegia [paralysis of the legs and lower body, typically caused by spinal injury or disease], tetraplegia [also known as quadriplegia, paralysis caused by illness or injury that results in the partial or total loss of use of all four limbs and torso], prevention and related conditions. With 150 beds, the SPC provides modern facilities for rehabilitation and therapy, diagnostics, surgery, ongoing care, orthopedic technology, as well as social services and 24-hour emergency care. In its 26-year history, the SPC has provided treatment and care to more than 20,000 in-patients. That number continues to grow exponentially due to the reputation of the SPC. In fact, the SPC’s staff performs their duties with effectiveness, expediency and cost-efficiency measures, requiring highly developed process-led medicine, centered around the needs of the patient. The areas of medical specialty and centers of excellence include the Swiss Paraplegic Centre (SPC), the Swiss Spinal Column and Spinal Cord Centre (SWRZ), the Centre for Pain Medicine (ZSM) and the Swiss Olympic Medical Center (SOMC). These centers respectively offer patients cutting-edge medical treatment based on the most advanced research in areas covering treatment and rehabilitation cases of acute paraplegia, vertebral and spinal cord surgery, as well as services relating to pain management, sports medicine and preventive health checks. Alongside the core focus on paraplegiology, the SPC is also equipped with the necessary medical facilities, allowing for the lifelong care of paraplegic patients. The SPC provides individually-tailored, comprehensive treatment in three phases (acute, reactivation and integration) using highly skilled staff and state-of-the-art equipment. The aim is always to re-establish a patient’s personal functionality, self-image and lifestyle to the fullest possible extent, with a holistic approach to treatment that includes mental, physical and psycho-social aspects, such as career, family and leisure activities. Specialist services available at the SPC include amongst others orthopedics, neuro-urology, pain medicine, sports medicine, prevention, clinical research, emergency medicine, vehicle conversion and rehabilitation techniques. Medico-therapeutic treatments, such as physiotherapy, ergotherapy and training therapy are available, alongside advice and counseling services, such as professional reintegration. The SPC is the largest of Switzerland’s four special hospitals for paraplegics and tetraplegics located in Nottwil/Lucerne, a town in central Switzerland on the shores of Lake Sempach. The other three facilities are in Basel, Sion and Zurich. Nowadays, the SPC consistently treats more than 60 percent of people with spinal cord injury in Switzerland and is fully occupied year-round. Image SOURCE: Photographs courtesy of Swiss Paraplegic Centre, Nottwil, Switzerland. Interior and exterior photographs of the hospital. Below is my interview with Hospital Director Dr. Med. Hans Peter Gmünder, M.D., which occurred in March, 2017. As a privately owned clinic with a specialty in the rehabilitation of patients with spinal cord injuries, how do you keep the spirit of research and innovation alive? Dr. Med. (medicinae) Gmünder: The goal of the Swiss Paraplegic Foundation, an umbrella organization that encompasses the Swiss Paraplegic Centre, is to create a unique network of services for people with spinal cord injury, from primary care through to the end of their lives. Its aim is to provide comprehensive rehabilitation and to reintegrate those affected into family life, society and the working environment. We want to maintain our pioneering and leading role in the fields of acute medicine, rehabilitation and lifelong assistance to people with spinal cord injuries. By providing a comprehensive network of services featuring solidarity, medical care, integration and lifelong assistance, as well as research all in one place, we are unique in Switzerland and in other countries around the world. People with spinal cord injury rely upon our network of services, which are at their disposal throughout their lives. The challenge facing us is to continually adapt these services to reflect current research and treatment to comply with our mission of delivering high-quality services. The trust which has been placed in us obliges us to continue our success story. We have our own research department, closely linked to the Swiss Paraplegic Centre, and dedicated employees who draw upon their wide-ranging professional networks to stay on top of the latest international research. We have a few examples that we’d like to share with you. In 2013, the World Health Organization (WHO) published its first international health report on the topic of spinal cord injury, “International Perspectives on Spinal Cord Injury.” It was developed in collaboration with Swiss Paraplegic Research in Nottwil and a team of international experts. In the summer of 2014, the Swiss Paraplegic Centre became the first rehabilitation center in Switzerland to implement exoskeletons [external covering for the body that provides both support and protection] in the rehabilitation and training of patients with spinal cord injury. Our experiences are included in an international study, and will contribute to the development of useful mobility aids for people with spinal cord injuries. At the end of October 2016, an estimated 9,000 visitors came to Nottwil for two days of celebrations to mark five anniversaries — the Swiss Paraplegic Foundation turned 40, the Swiss Paraplegics Association was 35, the Swiss Paraplegic Centre celebrated 25 years, Swiss Paraplegic Research reached 15 years, and it was the 80th birthday of the founder and honorary president, Dr. Med. Guido A. Zäch, M.D. What draws patients to the Swiss Paraplegic Centre? Dr. Gmünder: We support people with spinal cord injuries throughout their lives. It is the unique, holistic approach to acute medicine, rehabilitation and lifelong medical, professional and social assistance that draws patients from Switzerland and many other countries to our clinic in Nottwil. For example, in cases where we have individuals involved in serious accidents, the comprehensive rehabilitation of a patient with spinal cord injury begins at the scene of the accident. The aim of comprehensive assistance follows in three stages – acute, reactivation and integration phase – through the appropriate, individual deployment of specialist personnel and instruments. We rescue the individual at the scene of the accident and provide the right acute therapy. What follows is an initial rehabilitation through specialists in diagnosis, surgery, therapy and care, and then comes lifelong support and care with the aid of specialists. Following the disproportionately high percentage of people with tetraplegia admitted to the Centre for initial rehabilitation in 2014, our specialist clinic reported a higher proportion of people with paraplegia in 2015. Spinal cord injuries resulted from an accident in around half of all initial rehabilitation cases: falls led to the spinal cord injury in the case of 43 percent of people affected, sports accidents with 35 percent and road traffic accidents in 18 percent. In fact, 52,482 nursing days were clocked for a total of 1,085 in-patients who were discharged from the clinic after initial rehabilitation or follow-up treatment in 2015. “I was a cheesemaker for 33 years with my own dairy; gardening was my second love. That was before I had my accident helping out on my son’s farm. I need a new hobby now that I will enjoy, that will fill my time and give me something to do when I get back home. Making art out of lime wood could appeal to me. While it is difficult for me to make the small cuts in the wood as I lack strength in my hand, patience will reap rewards. My most important objective? To be able to stand on my own feet and take a few steps again. I should have achieved that by the time I am discharged from the clinic in five months.” — Josef Kobler (58), tetraplegic following an accident. “Since being diagnosed with a spinal cord injury, I come back to Nottwil a lot. For instance, to go the Wheelchair Mechanics Department to have the settings of my new wheelchair optimized. It replaces my legs and must fit my body perfectly. However, in most cases I attend the Centre for Pain Medicine of the SPC as an outpatient in order to have the extremely severe pains and muscle cramps, which I suffer from every day, alleviated. They became so severe that I had a pain pump with medication implanted at the SPC. It is apparent now that unfortunately the effect isn’t permanent. We are now giving electrostimulation a try. This involves applying electrodes to the vertebral canal. If I could finally get my pain under control, I would be able to return to work and set up my own business. That is my biggest wish. I have had an idea about what I could do.” — Hervé Brohon (41), paraplegic following an accident. “I have always been passionate about cooking and have enjoyed treating my family and guests to my dishes and to the aperitifs that I have created myself. I absolutely want to be able to do that again. As independently as possible, of course. That is my objective. I have availed of the opportunity on a few occasions to try out the obstacle-free practice apartment and kitchen at the SPC. If I am able to go home in four weeks, my kitchen will also be adapted to be wheelchair-friendly. Whether I am cooking for two, four or six people is a much bigger consideration as a wheelchair user. I now have to consciously allow for time and effort. However, one thing is certain: I can’t wait to welcome my first guests.” — Isa Bapst (73), paraplegic following an accident. How is the Swiss Paraplegic Centre transforming health care? Dr. Gmünder: The Swiss Paraplegic Centre offers an integrated healthcare structure, including a wide range of medical specialists covering every aspect of medical care for those with spinal cord injuries. In selected core disciplines for the care of people with spinal cord injuries, we also treat a large number of patients without spinal cord injuries. This relates primarily to pain medicine, spine- and spinal cord surgery and respiratory medicine. In fact, the Swiss Paraplegic Foundation, our umbrella organization, has been an unbelievable success story, operating a network of services to benefit people with spinal cord injury. Our Chairman of the Board of Trustees, Dr. Sc. Techn. (scientiae technicarum) Daniel Joggi, knows what it’s like to become totally dependent as he has been in a wheelchair for the past four decades. At the Swiss Paraplegic Centre, a 24-hour emergency department is staffed to handle any emergency. Please provide your thoughts on this critical component of diagnosis and care for newly diagnosed patients. Dr. Gmünder: Yes, our Centre is recognized by the Swiss Union of Surgical Societies as a specialist clinic for first-aid treatment of paraplegics. Statistics and experience clearly show that in 80 out of 100 cases, the damage to the spine and the spinal cord is not definite immediately after an accident. In the first six hours, there are real chances to mitigate or even avoid an imminent cross-paralysis. After that it is usually too late. In addition to transferring an individual directly to the SPC, appropriate acute care is another important criterion for the success of the individual affected by spinal cord issues. That means that individuals are in the right place for the subsequent, comprehensive rehabilitation. Central location proximity and quick access from all parts of the country. Dr. Gmünder: The Swiss Paraplegic Research (SPR), connected to the Swiss Paraplegic Centre, is part of the Swiss Paraplegic Foundation (SPF) and is an integral part of the Nottwil campus. It is the mission of Swiss Paraplegic Research to sustainably improve the situation of people with paraplegia or tetraplegia through clinical and interdisciplinary research in the long-term. The areas that are aimed to be improved are functioning, social integration, equality of opportunity, health, self-determination and quality of life. Our Swiss Paraplegic Research has been supported by the Federal Government of Switzerland and by the Canton of Lucerne for eight years as a non-university research institution. We are proud of this accomplishment. Our main research domains are in the areas of aging, neuro-rehabilitation, musculo-skeletal health, preserving and improving function of upper limbs, pain, pressure sores, respiration, urology and orthopedics. The goal of Swiss Paraplegic Research is to promote the study of health from a holistic point of view, by focusing on the ‘lived experience’ of persons with health conditions and their interaction with society. We are, therefore, establishing a research network for rehabilitation research from a comprehensive perspective on a national and international level. This network will make it possible to practically apply the latest research findings to provide the best possible care and reintegration for people with paraplegia or tetraplegia. This year, we received the approval of 18 new research projects and we had a total of 36 studies in progress under review, undertaken by and with the involvement of the Clinical Trial Unit (CTU), the department for clinical research at the Centre. For example, the successful implementation of a multi-center study on the use of walking robots (exoskeleton) merits special mention. Research was carried out in that study into the wide range of effects of maintaining movement for people with spinal cord injury. The CTU will continue to carry out research in Rehabilitation Engineering in a cooperation with Burgdorf University of Applied Science and the research group headed by Professor Kenneth Hunt. The “Life and Care” symposium on breathing and respiration organized by the CTU provided a platform for an international knowledge exchange with national and international experts. This is crucial for further scientific development in respiratory medicine. In 2015, the CTU also launched the CTU Central Switzerland, in association with Lucerne Cantonal Hospital and the University of Lucerne. It supports clinics which are actively engaged in research with specific services, thereby enhancing Switzerland’s standing as a center of research. How does the Swiss Paraplegic Foundation support your vision? Dr. Gmünder: The Swiss Paraplegic Group includes the Swiss Paraplegic Foundation, which was established in 1975, two partner organizations — the Benefactors’ Association and the Swiss Paraplegics Association, and six companies owned by the Foundation. Those six companies are the Swiss Paraplegic Centre, the Swiss Paraplegic Research, Orthotec AG, ParaHelp AG, Sirmed Swiss Institute of Emergency Medicine AG, Seminarhotel Sempachersee AG. The Swiss Paraplegic Foundation, founded by Dr. Med. Guido A. Zäch in 1975, is a solidarity network for people with spinal cord injuries, unrivaled anywhere in the world. Its work is based on the vision of medical care and comprehensive rehabilitation for people with paraplegia and tetraplegia, with a view towards enabling them to lead their lives with self-determination and with as much independence as possible, supported by the latest advances in science and technology. The unique network of services of the Foundation is a strategic mix of Solidarity, Research, Medicine and Integration and Lifelong Assistance. Let me elaborate on these services. The Foundation provides a comprehensive range of services for every area of a person’s life who has a spinal cord injury. The Nottwil campus serves to be a center of excellence for integration, assistance and lifelong learning for our patients. The Foundation ensures that its benefactors and donors are aware of our list of services and can support us longer term. The Foundation establishes a national and international network that will guarantee better basic conditions for people with spinal cord injury. The Foundation encourages training of specialized personnel in the field of spinal cord injury. The Foundation contributes to the sustainable improvement of health, social integration, equal opportunities and self-determination of people with spinal cord injury by carrying out rehabilitation research. The Foundation works closely with the World Health Organization (WHO) and encourages exchanges with universities and institutions locally and globally for the latest scientific findings and conducts academic training at the University of Lucerne. The Foundation develops high-quality care standards for its patients. The Foundation offers all medical services needed for professional acute care and rehabilitation of people with spinal cord injury and encourages patients to become involved in their therapy and to take responsibility for their lives. The Foundation strengthens relationships with partners in specific disciplines and local institutions to benefit people with spinal cord injury. The Foundation is a member of committees with political influence to ensure that its patients receive highly specialized medical care. The Foundation establishes a network throughout Switzerland to help people with spinal cord injury. The Foundation offers comprehensive services to meet people’s needs to improve their integration into society. The Foundation encourages people with spinal cord injury to lead an independent life and educate family and friends so they can provide the necessary support. Moreover, in cases of hardship, the Foundation makes contributions towards the cost of walking aids, equipment and amenities for people with paraplegia and tetraplegia. It also takes on uncovered hospital and care costs. Current market research shows that the Swiss Paraplegic Foundation ranks among the three most highly rated aid organizations in Switzerland. Can you please elaborate on why? Dr. Gmünder: That is true. The Foundation is highly rated in terms of goodwill, innovation, competence and effectiveness. In addition, it is regarded as undoubtedly the most competent organization representing people with disabilities in Switzerland, according to several market research surveys. So that we can continue to meet the demand for our patients, families and other visitors, plans are under way to upgrade our clinic and hotel on our premises. We generally have interest from visitors to visit our Centre. Our guided tours and events enabled the general public to see how the foundation concept is put into practice, day in, day out. In Nottwil, 160 guides provided more than 11,000 visitors with a glimpse into the operations at our specialist clinic. Additionally, we organized more than 5,000 scientific meetings attended by more than 170,000 people in 2015. And our wheelchair athletes take part in two major competitions, the IPC Athletics Grand Prix and the UCI Para-cycling World Championships, at our Nottwil site. It is our hope to continue to motivate individuals with spinal cord injuries to be involved in healthy exercise. Since you became Hospital Director, how have you changed the way that you deliver health care or interact with patients? Dr. Gmünder: It is important to me that the patients and their needs are the focus of our efforts. As such, one of my main tasks is to align our processes with our patients. We started construction with a newly expanded Intensive Care Medicine, Pain Medicine and Surgical Medicine department last year to provide patients with an expanded variety of cross-linked treatments. Certified as a nationwide trauma center, our Swiss Spinal Column and Spinal Cord Centre has become increasingly recognized throughout the country with large numbers of non-paralyzed patients, who have severe spinal cord injury, being referred to our facility. It is under the medical leadership of the Head of Department Dr. Med. Martin Baur, M.D. This highly specialized acute care facility recently received certification as a specialist center for traumatology within the Central Swiss Trauma Network. We believe in developing the next generation of professionals and our Department of Anesthesia was recognized as a center of further training; the first two junior doctors have been appointed and postgraduate courses in anesthesia nursing are already available. Our Swiss Weaning Centre, where individuals learn to breathe without a machine, has brought specialists from Intensive Care Medicine, Speech Therapy, RespiCare and Spinal Cord Medicine even closer together in a new process structure for respiratory medicine. At the same time, the Swiss Weaning Centre reported increased referrals from university hospitals and private clinics, as well as numerous successes with patients who had proved to be difficult to wean from respiratory equipment. Our Centre for Pain Medicine, one of the largest pain facilities in the country, reported a further increase in inpatient treatments. Epiduroscopy, which was introduced in 2014, has proved to be a success. It is a percutaneous, minimally invasive procedure which is used in the diagnosis and treatment of pain syndromes near the spinal cord. We reached a milestone in tetra hand surgery. The team of our doctors has been consulting at two other spinal cord injury centers and have used these occasions to show doctors around the country what possibilities there are for improved hand and grip functions, leading to an enhanced quality of life. In what ways do you rehabilitate the whole patient? Why is this important early on in treatment? Dr. Gmünder: In accordance with our vision, we are not just focusing on physical rehabilitation but on the entire person in their social environment (leisure, work, housing, mobility). Due to our broad organizational structure, we have many resources at our disposal. The rate of reintegration for people who did their primary rehabilitation at the Swiss Paraplegic Centre is almost 65 percent – one of the highest in the world. Because we work to address diagnosis, treatment and management of traumatic spinal cord injuries with our patients, we take great care in working with patients on their medical disabilities, physical disabilities, psychological disabilities, vocational disabilities, social aspects and any health complications. That means that we not only treat patient’s medically, but also we treat them through therapy and complementary medicine, such as art therapy, sports and water therapy and homeopathic medicine. At the SPC, we nurture a culture which is characterized by common values and shared objectives, namely commitment, leadership, a humane approach, cooperation and openness and fairness in our dealing with one another and with our patients. As you follow patients throughout their rehabilitation and treatment, what are you most proud of at the Centre? Dr. Gmünder: Research has shown that early referral of a patient with a traumatic spinal injury lessens the complications, shortens the length of time in the hospital and is, therefore, more cost-effective. We are confronted by individuals every day whose abilities have been limited by disease, trauma, congenital disorders or pain – and we are focused on enabling them to achieve their maximum functional abilities. Our patients have a better outcome and quality of life, patient-focused treatment, ongoing case management, and lifelong care. It’s important to emphasize that our comprehensive rehabilitation of individuals with spinal cord injuries begins on the first day after the accident or trauma. On one hand, the medical treatments with paraplegia or tetraplegia are performed by a multidisciplinary medical team. And on the other hand, it is our goal to give those individuals their personality and life structure as quickly – and as best – as possible. An individual’s medical condition affects their psychological, physical and social aspects of life. We focus on individualized treatment for the greatest possible independence for our patients. When patients are satisfied with our work and its results, they can resume a self-determined life. That is our greatest joy. Image SOURCE: Photograph of Hospital Director Hans Peter Gmünder, M.D., courtesy of Swiss Paraplegic Centre, Nottwil, Switzerland. Hans Peter Gmünder, M.D., assumed the role of Hospital Director of the Swiss Paraplegic Centre in 2011. He is a German-Belgian double citizen. Previously, Dr. Gmünder was Chief Physician and Medical Director of the Rehaklinik Bellikon, a rehabilitation and specialist clinic for traumatic acute rehabilitation, sports medicine, professional integration and medical expertise for 10 years in the canton of Aargau, Switzerland. He began his career at the Swiss Paraplegic Centre in the 1990s as Assistant and Senior Physician, and later as Chief Physician and Deputy Chief Physician. He completed a B.S. degree in Business Administration at SRH FernHochschule Riedlingen in 2010 and an M.D. degree at Freie Universität Berlin in 1987. He is married to Sabeth and is the father of two children. We would like to thank Claudia Merkel, head of public relations, Swiss Paraplegic Centre, for the help and support she provided during this interview. The Swiss Paraplegic Centre (http:// www.paraplegie.ch), Nottwil, Switzerland. The Rehabilitation Institute of Chicago (https://www.sralab.org/new-ric), located in Chicago, Illinois, has been ranked as the number one rehabilitation hospital in the United States for the past 24 years by U.S. News and World Report. It is a 182-bed research facility that focuses solely on rehabilitation in many areas, including spinal cord, brain, nerve, muscle and bone, cancer and pediatric. For example, the rehabilitation course for patients with spinal cord injury requires precise medical and nursing expertise, respiratory and pulmonary care and sophisticated diagnostic and therapeutic equipment. For several years, the hospital has dedicated investments in talent, space and equipment that attract a high volume of patients with challenging conditions. The high volume, diversity of condition and greater complexity enables them to expand their experience in helping patients recover from spinal cord injury. Primary goals for patients include the emergence of meaningful motor function, sensation, coordination and endurance, resolution of respiratory and vascular instability, and overall continued medical recovery from the injury or disease. The Spaulding Rehabilitation Hospital Boston (http://spauldingrehab.org/about/facts-statistics) is ranked number five in the country by U.S. News and World Report and number one in New England. As a unique center of treatment excellence and a leading physical medicine and rehabilitation research institution, Spaulding Boston is comprised of major departments in all areas of medicine requiring rehabilitation. They are a nationally recognized leader in innovation, research and education. The facility also has been the source of significant treatment innovations with dramatic implications for a range of conditions, including amputation and limb deficiencies, brain injury, cardiac rehabilitation, pulmonary rehabilitation and spinal cord injuries, to name a few. http://spauldingrehab.org/conditions-and-treatments/list. The ACGME accredited Harvard Medical School/ Spaulding/ VA Boston Fellowship Program in Spinal Cord Injury (SCI) Medicine is a 12-month training program that offers advanced clinical training in SCI, a strong didactic component, and opportunities for research with protected elective time. The curriculum is designed to provide exposure to the full spectrum of SCI care and includes rotations at VA Boston, Spaulding Rehabilitation Hospital, and Brigham & Woman’s Hospital. Requirements include prior completion of an approved residency program in a specialty such as physical medicine and rehabilitation, neurology, internal medicine, family practice, surgery, or other specialties relevant to spinal cord injury. http://spauldingrehab.org/education-and-training/spinal-cord-fellowship. Specifically, the Spaulding Rehabilitation Network is at the forefront of innovative treatment for major disabling conditions, including spinal cord injury (SCI), traumatic brain injury (TBI), other traumatic injuries, stroke, and neuromuscular disorders such as multiple sclerosis, cerebral palsy, and Parkinson’s disease. At Spaulding, the treatment goals go far beyond immediate rehabilitation to address long-term health and function, as well as giving patients encouragement and hope as they return to their lives in the community. The hub of their spinal cord injury program is the Spaulding-Harvard Spinal Cord Injury Model Systems (SCIMS) Rehabilitation Program, led by experts at Spaulding Boston, a Center of Excellence in spinal cord injury rehabilitation. With the guidance of their physicians and other rehabilitation specialists and access to some of the most advanced technologies available today, their patients have the resources to strive for their highest level of neurorecovery – and to develop successful, enriching strategies for independent living. When potentially life-altering spinal cord injury occurs, the Spaulding Rehabilitation Network clinicians are dedicated to pioneering improved therapies that can make all the difference to a patient’s immediate and long-term recovery. Their goal is to support a patient’s return to an active, productive and fulfilling life. Whether the spinal cord injury is due to traumatic injury or illness, their team of experts will develop a treatment plan in collaboration with the patient and family. Depending on the severity of the injury, their teams work on improving function in: walking, balance and mobility; speech, swallowing and breathing; thinking (cognition), behavior and safety; dressing, bathing and other activities of daily living; incontinence, bowel and bladder function. Intensive, hospital-level rehabilitation with goal-directed therapy 3 – 5 hours a day, at least 5 days a week for inpatients. Long-term care and rehabilitation for patients with complicating conditions. Ventilator program to wean patients off mechanical breathing support in preparation for transition to more intensive rehabilitation. Cutting-edge spinal cord injury technologies and therapeutic techniques. Emphasis on family participation throughout the course of care. with an inpatient comprehensive training and education series. Seamless transition to multi-disciplinary outpatient rehabilitation. Coordination of care with Spaulding’s outpatient centers. Vocational training, participation in research, support groups. Spaulding Rehabilitation Network is the official teaching partner of the Harvard Medical School Department of Physical Medicine and Rehabilitation (PM&R). The Spaulding network’s facilities are members of Partners HealthCare, founded by Massachusetts General Hospital and Brigham and Women’s Hospital. The knowledge and expertise of this entire healthcare system is available to patients and caregivers. Their continuum of superb healthcare ensures that patients will find the care they need throughout their journey and the strength they need to live their life to the fullest. Teva is stopping a Phase 3 study evaluating Ajovy as a cluster headache treatment after a futility analysis showed the migraine drug is unlikely to reduce the number of attacks, the Israeli drugmaker said Tuesday. The trial discontinuation will expand the opportunity for Eli Lilly’s Emgality to differentiate itself with a new indication in episodic cluster headaches. A Lilly spokesperson said the drugmaker expects a Food and Drug Administration decision in the second quarter for its supplemental application, which received priority review designation last month. These types of medicines, called CGRP inhibitors, entered the preventive migraine space last year with three launches within a few months. Teva is carrying on Ajovy development with a Phase 2 study in post-traumatic headache, while Lilly is evaluating its drug in Phase 3 studies for preventing migraines in adolescents. The researchers reviewed 105 U.S.-based randomized controlled trials, from the past 50 years, that were relevant to pain patients in the United States and met inclusion criteria. Although the reporting of safety information was low overall, none of the clinical trials reported significant side effects due to the interventions. Though the evidence was weaker, the researchers also found that massage therapy, spinal manipulation, and osteopathic manipulation may provide some help for back pain, and relaxation approaches and tai chi might help people with fibromyalgia. Read more about this report and find graphics at nccih.nih.gov/pain_review. About the National Center for Complementary and Integrative Health (NCCIH): NCCIH’s mission is to define, through rigorous scientific investigation, the usefulness and safety of complementary and integrative health approaches and their roles in improving health and health care. For additional information, call NCCIH’s Clearinghouse toll free at 1-888-644-6226, or visit the NCCIH Web site at nccih.nih.gov. Follow us on Twitter(link is external), Facebook(link is external), and YouTube. BIA 10-2474 is an experimental fatty acid amide hydrolase inhibitor developed by the Portuguese pharmaceutical company Bial-Portela & Ca. SA. The drug was developed to relieve pain, to ease mood and anxiety problems, and to improve movement coordination linked to neurodegenerative illnesses. It interacts with the humanendocannabinoid system. It has been linked to severe adverse events affecting 5 patients in a drug trial in Rennes, France, and at least one death, in January 2016. French newspaper Le Figaro has obtained Bial study protocol documents listing the the chemical name of BIA-10-2474 as 3-(1-(cyclohexyl(methyl)carbamoyl)-1H-imidazol-4-yl)pyridine 1-oxide. A Bial news release described BIA-10-2474 as “a long-acting inhibitor of FAAH”. Fatty acid amide hydrolase (FAAH) is an enzyme which degrades endocannabinoid neurotransmitters like anandamide, which relieves pain and can affect eating and sleep patterns. FAAH inhibitors have been proposed for a range of nervous-system disorders including anxiety, alcoholism, pain and nausea. The Portuguese pharmaceutical company Bial holds several patents on FAAH enzyme inhibitors. No target organ was identified during toxicology studies and few adverse clinical findings were observed at the highest dose tested. For the single ascending dose part [of the clinical trial], a starting dose of 0.25 mg was judged to be safe for a first-in-human administration. The protocol defines no starting dose for the multi-dose treatment groups, noting that this will be based on the outcome of the single dose portion of the trial (an approach known as adaptive trial design). The authors note that nonetheless, the starting dose will not exceed 33% of the maximum tolerated dose (MTD) identified in the single dose groups (or 33% of the maximum administered dose if the MTD is not reached). In July 2015 Biotrial, a contract research organization, began testing the drug in a human phase one clinical trial for the manufacturer. The study was approved by French regulatory authority, the Agence Nationale de Sécurité du Médicament (ANSM), on June 26, 2015, and by the Brest regional ethics committee on July 3, 2015. The trial commenced on July 9, 2015, in the city of Rennes, and recruited 128 healthy volunteers, both men and women aged 18 to 55. According to French authorities, the study employed a three-stage design with 90 of the volunteers having received the drug during the first two stages of the trial, with no serious adverse events being reported . Participants of the study were to receive €1,900 and, in turn, asked to stay at Biotrial’s facility for two weeks during which time they would take the drug for ten days and undergo tests. In the third stage of the trial evaluating multiple doses, six male volunteers received doses by mouth, starting on 7 January 2016. The first volunteer was hospitalized at theRennes University Hospital on January 10, became brain dead, and died on January 17. The other five men in the same dosage group were also hospitalized, in the period of January 10 through January 13 four of them suffering injuries including deep hemorrhagic and necrotic lesions seen on brain MRI. The six men who were hospitalised were the group which received the highest dose. A neurologist at the University of Rennes Hospital Center, Professor Pierre-Gilles Edan, stated in a press conference with the French Minister for Health, that 3 of the 4 men who were displaying neurological symptoms “already have a severe enough clinical picture to fear that even in the best situation there will be an irreversible handicap” and were being given corticosteroids to control the inflammation. The sixth man from the group was not showing adverse effects but had been hospitalized for observation. Biotrial stopped the experiment on January 11, 2016. Le Figaro posted a 96-page clinical study protocol for BIA 10-2474 that the French newspaper procured from an unnamed source. According to the document, BIA 10-2474 is 3-(1-(cyclohexyl(methyl)carbamoyl)-1H-imidazol-4-yl)pyridine 1-oxide. The clinical trial protocol also notes that the company tested BIA 10-2474 on mice, rats, dogs, and monkeys for effects on the heart, kidneys, and gastrointestinal tract, among other pharmacological and toxicological evaluations. The clinical trial, conducted by the company Biotrial on behalf of the Portuguese pharmaceutical firm Bial, was evaluating a pain relief drug candidate called BIA 10-2474 that inhibits fatty acid amide hydrolase (FAAH) enzymes. Blocking these enzymes prevents them from breaking down cannabinoids in the brain, a family of compounds that includes the euphoria-inducing neurotransmitter anandamide and Δ9-tetrahydrocannabinol, the major psychoactive component of marijuana. Phase I clinical trials are conducted to check a drug candidate’s safety profile in healthy, paid volunteers. In this case, the drug caused hemorrhagic and necrotic brain lesions in five out of six men in a group who received the highest doses of the drug, said Gilles Edan, a neurologist at the University Hospital Center of Rennes. The French health minister has stated the drug acted on natural receptors found in the body known as endocannibinoids, which regulate mood and appetite. It did not contain cannabis or anything derived from it, as was originally reported. All six trial participants were administered the doses simultaneously. The trial was being performed at Biotrial, a French-based firm that was formed in 1989 and has conducted thousands of trials. A message on the company’s website stated that they are working with health authorities to understand the cause of the accident, while extending thoughts to the patients and their families. Bial has disclosed the drug was a FAAH (fatty acid amide hydrolase) inhibitor, which is an enzyme produced in the brain and elsewhere that breaks down neurotransmitters called endocannabinoids. Two scientists from the Nottingham Medical School who have worked with FAAH tried over the weekend to try and identify the drug by examining a list of drugs Bial currently has in its pipeline. They believe the culprit is one identified by the codename BIA 10-2474. While safety issues like this are rare, they are not unheard of. In 2006, a clinical trial in London left six men ill. All were taking part in a study testing a drug designed to fight auto-immune disease and leukemia. Within hours of taking the drug TGN1412, all experienced a serious reaction, were admitted to intensive care, and had to be treated for organ failure. The Duff Report, written in response to the TGN1412 trial, noted the medicine should have been tested in one person at a time. It also helped to put additional safety measures in place. The Medicines and Health Products Regulatory Agency (MHRA) now requires committees to look at pre-clinical data to determine the proper initial dose, and rules are in place to stop the trial if unintended reactions occur. Other pharmaceutical companies, including Merck, Pfizer, Johnson & Johnson, Sanofiand Vernalis, have previously taken other FAAH inhibitors into clinical trials without experiencing such adverse events (e.g. respectively, MK-4409, PF-04457845,JNJ-42165279, SSR411298 and V158866. Related enzyme inhibitor compounds such as URB-597 and LY-2183240 have been sold illicitly as designer drugs, all without reports of this type of toxicity emerging, so the mechanism of the toxicity observed with BIA 10-2474 remains poorly understood. Probuphine is a small rod that contains the medication buprenorphine, which was approved by the FDA for opioid addiction in 2002. Developed by Titan Pharmaceuticals and Braeburn Pharmaceuticals, the rod is placed under the skin (usually in the upper arm) by a doctor in an office procedure. One implant provides patients with 6 months of continuous buprenorphine dosing. Buprenorphine is often taken in combination with a medication called naloxone. Acting as an antidote for overdoses, naloxone negates the effect of any additional opiates. At present, buprenorphine is typically administered orally in daily doses or indissolvable strips. On January 12, the FDA Psychopharmacologic Drugs Advisory Committee voted in favor of approving Probuphine, the first long-acting, subdermal buprenorphine implant for the maintenance treatment of opioid addiction in stable patients receiving 8 mg or less per day of buprenorphine. Interestingly enough, however, the same committee previously rejected Probuphine in 2013—requesting new clinical data and additional information before the company could resubmit. The FDA sent a letter to Titan, which detailed recommendations on product labeling and ways to improve the company’s proposed risk evaluation and mitigation strategy for the candidate. Based on results from the company’s Phase 3 trial of 177 patients in 2015, Titan narrowed the implant’s indication to patients receiving 8 mg or less per day of buprenorphine. Acknowledging that the implant had advantages compared to other formulations—such as its being difficult to abuse and is less likely to be ingested accidentally by children—the FDA expressed concerns about the implantation and removal, as surgeons must be trained on these procedures. 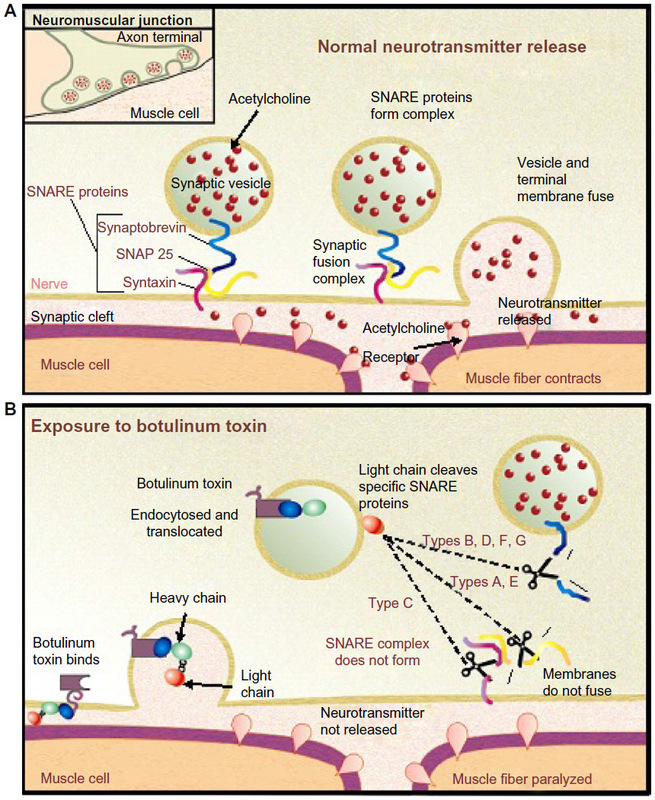 Botulinum neurotoxins (BoNTs), the most potent toxins known to mankind, are metalloproteases that act on nerve–muscle junctions to block exocytosis through a very specific and exclusive endopeptidase activity against soluble N-ethylmaleimide-sensitive factor attachment protein receptor (SNARE) proteins of presynaptic vesicle fusion machinery. This very ability of the toxins to produce flaccid muscle paralysis through chemical denervation has been put to good use, and these potentially lethal toxins have been licensed to treat an ever expanding list of medical disorders and more popularly in the field of esthetic medicine. In most cases, therapeutic BoNT preparations are high-molecular-weight protein complexes consisting of BoNT, complexing proteins, and excipients. There is at least one isolated BoNT, which is free of complexing proteins in the market (Xeomin®). Each commercially available BoNT formulation is unique, differing mainly in molecular size and composition of complexing proteins, biological activity, and antigenicity. BoNT serotype A is marketed as Botox®, Dysport®, and Xeomin®, while BoNT type B is commercially available as Myobloc®. Nerve terminal intoxication by BoNTs is completely reversible, and the duration of therapeutic effects of BoNTs varies for different serotypes. Depending on the target tissue, BoNTs can block the cholinergic neuromuscular or cholinergic autonomic innervation of exocrine glands and smooth muscles. Therapeutic BoNTs exhibit a high safety and very limited adverse effects profile. Despite their established efficacy, the greatest concern with the use of therapeutic BoNTs is their propensity to elicit immunogenic reactions that might render the patient unresponsive to subsequent treatments, particularly in chronic conditions that might lead to long-term treatment and frequent injections. Botulism was first identified in the early 19th century by Justinus Kerner, a German doctor and poet, when he linked deaths from food intoxication with a poison found in smoked sausages.3 He had even speculated about a variety of potential therapeutic uses of botulinum toxin for movement disorders, hypersecretion of body fluids, ulcers, etc.4 The scientific parameters of the disease were uncovered in 1897 by Emile van Ermengem, who successfully isolated the bacterium and named it Bacillus botulinus,5,6 which was renamed C. botulinum in later years. In 1928, Snipe and Sommer at the University of California isolated BoNT as a stable acid precipitate for the first time,7 following which, standardized preparations of BoNT and maintenance of rigorous safety standards for its therapeutic use were achieved by Edward J Schantz, Carl Lammana, and colleagues from the Department of Microbiology and Toxicology at the University of Wisconsin, Madison.8–10 The first documented use of BoNT for the treatment of disease was in the 1970s, approximately 150 years after Kerner’s initial observations about the potential use of BoNT as a therapeutic, when Dr Alan Scott, an ophthalmologist, used local injection of minute doses of BoNT to selectively inactivate muscle spasticity in strabismus in monkeys.11 Following the success of a series of clinical studies on humans suffering from strabismus,12 the Food and drug Administration (FDA) in 1989 approved the use of BoNT/A (BOTOX®), manufactured by Allergan pharmaceuticals, for the treatment of strabismus, blepharospasm, and hemifacial spasm. Since then the very lethal botulinum toxins, botulinum types A and B, have been extensively used for the treatment of a myriad of dystonic and nondystonic movement disorders and a host of other medical conditions, including axillary hyperhidrosis, spasticity, tremors, and pain management. The high efficacy of BoNT/A coupled with a good safety profile has prompted its empirical use in a variety of ophthalmological, urological, gastrointestinal, secretory, and dermatological disorders.13 Incredibly, the list of conditions treated with botulinum toxin is expanding at a brisk rate. BoNT is produced as a single polypeptide chain with a molecular mass of ~150 kDa that displays low intrinsic activity. This precursor protein is subsequently cleaved by bacterial proteases at an exposed protein-sensitive loop generating a fully active neurotoxin, composed of a 100 kDa heavy chain (HC) and a 50 kDa light chain (LC). The HC and LC remain linked by both noncovalent protein–protein interactions and a conserved interchain disulfide bridge, called the belt, which extends from the HC and wraps around the LC.2 During intoxication process, the interchain bridge is reduced, and this is a necessary prerequisite for the intracellular action of the toxins.18 The three-dimensional structures of BoNTs reveal that they are folded into three distinct domains that are functionally related to their cell intoxication mechanism. The N-terminal domain is the 50 kDa LC, which is a Zn2+-dependent endoprotease. The 100 kDa HC consists of a N-terminal translocation domain and a C-terminal receptor-binding domain2 (Figure 1). Figure 1 Schematic representation of different domains of BoNT/A. 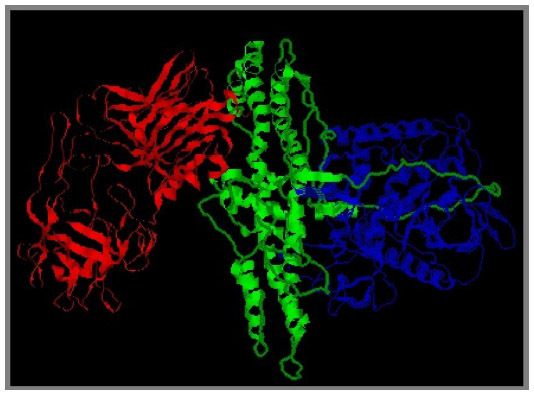 Note: The heavy chain receptor binding domain is marked in red, green is the heavy chain translocation domain, and the light chain catalytic domain is colored blue. Abbreviation: BoNT/A, botulinum neurotoxin type A. The nontoxic NAPs are believed to protect the neurotoxin from degradation during its passage through the low pH environment of the gastrointestinal tract.21 They are also known to assist BoNT translocation across the intestinal mucosal layer.22,23 The association of NAPs with the toxin is pH dependent, and at physiological pH, this complex is reported to rapidly dissociate allowing release of the neurotoxin in the blood stream.24,25 When used for therapeutic purposes, where BoNT/is not delivered orally, the role of these accessory proteins in protection against gastric pH extremes and proteases and in transport across the intestinal epithelium is not clear and not relevant to clinical efficiency. When therapeutic BoNT preparation is injected into the target tissue, it acts as a metalloproteinase that enters peripheral cholinergic nerve terminals and cleaves proteins that are crucial components of the neuroexocytosis apparatus, causing a persistent but reversible inhibition of neurotransmitter release. The exact molecular mechanism of BoNT action still remains to be completely understood but existing experimental evidence suggests that BoNT intoxication occurs through a multistep process involving each of the functional domains of the toxin.26 These steps include binding of the neurotoxin to specific receptors at the presynaptic nerve terminal, internalization of the toxin into the nerve cell and its translocation across the endosomal membrane, and intracellular endoprotease activity against proteins crucial for neurotransmitter release. Upon internalization into the neuronal cytosol, BoNTs exert their toxic effect by virtue of the metalloprotease activity of the LC, which specifically cleave one of three soluble N-ethylmaleimide-sensitive factor attachment protein receptor (SNARE) proteins that are integral to vesicular trafficking and neurotransmitter release.2 The specific SNARE protein targeted and the site of hydrolytic cleavage vary among the seven BoNT serotypes. BoNT serotypes A and E specifically cleave SNAP-25 at a unique peptide bond. BoNT serotypes B, D, F, and G hydrolyze VAMP/synaptobrevin, at different single peptide bonds, and BoNT/C cleaves both syntaxin and SNAP-252 (Figure 2). Figure 2 Schematic model of mode of action of botulinum neurotoxins. Abbreviations: SNARE, sensitive factor attachment protein receptor; BoNTs, botulinum neurotoxins. Despite a plethora of research on the molecular action and the medical uses of BoNTs, currently only two serotypes of BoNTs are commercially being used as therapeutics, type A (BoNT/A) and type B (BoNT/B). There are three preparations of BoNT/A that are approved by the FDA, namely, Botox® (onabotulinumtoxinA) manufactured by Allergan Inc., USA; Dysport® (abobotulinumtoxinA) by Ipsen Ltd, UK; and Xeomin® (incobotulinumtoxinA) manufactured by Merz Pharmaceuticals, Germany. BoNT serotype B (MYOBLOC®, rimabotulinumtoxinB; Solstice Neurosciences, USA) was approved by the FDA in year 2000.13 The remarkable therapeutic utility of BoNT lies in its ability to specifically and potently inhibit involuntary muscle activity for an extended duration. The major differences between the botulinum toxin drug preparations include the bacterial strains from which they are produced, their manufacturing processes, composition, and presence of NAPs, and the type and quantity of excipients used in each formulation. Nearly any part of your body is vulnerable to pain. Acute pain warns us that something may be wrong. Chronic pain can rob us of our daily life, making it difficult and even unbearable. Many people with chronic pain can be helped by understanding the causes, symptoms, and treatments for pain – and how to cope with the frustrations. You know your pain better than anyone — and as hard as it’s been to handle it, your experience holds the key to making a plan to treat it. It can be a process to find your best plan. You can try a combination of things and then report back to your doctor about how your pain is doing. Together, you can tweak your program based on what’s working and what needs more help. In order to make your pain management plan, your doctor will first consider whether you have sudden (“acute”) or long-term (“chronic”) pain. Acute pain starts suddenly and usually feels sharp. Broken bones, burns, or cuts are classic examples. So is pain after surgery or giving birth. Acute pain may be mild and last just a moment. Or it may be severe and last for weeks or months. In most cases, acute pain does not last longer than 6 months, and it stops when its underlying cause has been treated or has healed. If the problem that causes short-term pain isn’t treated, it may lead to long-term, or “chronic” pain. It can cause tense muscles, problems with moving, a lack of energy, and changes in appetite. It can also affect your emotions. Some people feel depressed, angry, or anxious about the pain and injury coming back. Chronic pain doesn’t always have an obvious physical cause. 1. Keep moving. You might think it’s best to rest on the sidelines. But being active is a good idea. You’ll get stronger and move better. The key is knowing what’s OK for you to do to get stronger and challenge your body, without doing too much, too soon. Your doctor can let you know what changes to make. For instance, if you used to run and your joints can’t take that now because you have a chronic condition like osteoarthritis, you might be able to switch to something like biking or swimming. 2. Physical and occupational therapy. Take your recovery to the next level with these treatments. In PT, you’ll focus on the exact muscles you need to strengthen, stretch, and recover from injury. Your doctor may also recommend “occupational therapy,” which focuses on how to do specific tasks, like walking up and down stairs, opening a jar, or getting in and out of a car, with less pain. 3. Counseling. If pain gets you down, reach out. A counselor can help you get back to feeling like yourself again. You can say anything, set goals, and get support. Even a few sessions are a good idea. Look for a counselor who does “cognitive behavioral therapy,” in which you learn ways that your thinking can support you as you work toward solutions. 4. Massage therapy. It’s not a cure, but it can help you feel better temporarily and ease tension in your muscles. Ask your doctor or physical therapist to recommend a massage therapist. At your first appointment, tell them about the pain you have. And be sure to let them know if the massage feels too intense. 5. Relaxation. Meditation and deep breathing are two techniques to try. You could also picture a peaceful scene, do some gentle stretching, or listen to music you love. Another technique is to scan your body slowly in your mind, and consciously try to relax each part of your body, one by one, from head to toe. Any healthy activity that helps you unwind is good for you and can help you feel better prepared to manage your pain. 6. Consider complementary treatments such as acupuncture, biofeedback, and spinal manipulation. In acupuncture, a trained practitioner briefly inserts very thin needles in certain places on your skin to tap into your “chi,” which is an inner energy noted in traditional Chinese medicine. It doesn’t hurt. Biofeedback trains you to control how your body responds to pain. In a session of it, you’ll wear electrodes hooked up to a machine that tracks your heart rate, breathing, and skin temperature, so you can see the results. When you get spinal manipulation, a medical professional uses their hands or a device to adjust your spine so that you can move better and have less pain. Some MDs do this. So do chiropractors, osteopathic doctors (they have “DO” after their name instead of “MD”), and some physical therapists. Are There Devices That Help? Although there are no products that take pain away completely, there are some that you and your doctor could consider. TENS and ultrasound. Transcutaneous electrical nerve stimulation, or TENS, uses a device to send an electric current to the skin over the area where you have pain. Ultrasound sends sound waves to the places you have pain. Both may offer relief by blocking the pain messages sent to your brain. Spinal cord stimulation. An implanted device delivers low-voltage electricity to the spine to block pain. If your doctor thinks it’s an option, you would use it for a trial period before you get surgery to have it permanently implanted. In most cases, you can go home the same day as the procedure. These may include over-the-counter pain relievers such as acetaminophen, aspirin, ibuprofen, or naproxen. Or you may need stronger medications that require a prescription, such as steroids, morphine, codeine, or anesthesia. Some are pills or tablets. Others are shots. There are also sprays or lotions that go on your skin. Other drugs, like muscle relaxers and some antidepressants, are also used for pain. Some people may need anesthetic drugs to block pain. It depends on why you’re in pain. If you’ve had a sudden injury or accident, you might need surgery right away. But if you have chronic pain, you may or may not need an operation or another procedure, such as a nerve block (done with anesthetics or other types of prescription drugs to halt pain signals) or a spinal injection (such as a shot of cortisone or an anesthetic drug). Talk with your doctor about what results you can expect and any side effects, so you can weigh the risks and the benefits. Also ask how many times the doctor has done the procedure they recommend and what their patients have said about how much relief they’ve gotten.